In Part 1 of How to Find Great Kerala Accommodation I featured some useful websites for finding places to stay in Kerala, including i-escape for special and stylish hotel reviews, TripAdvisor for extensive hotel reviews and a number of forums where you can ask advice from experienced travellers. Here are some more helpful resources for finding your perfect place to stay in Kerala. Mahindra Homestays is a booking service for homestays throughout India. It isn’t independent, but it is a useful way to find homestays, with plenty listed in Kerala. The photos and descriptions for each homestay are quite detailed and some have reviews by guests. Each homestay is inspected to ensure that it complies with the high standards of Mahindra Homestays, including comfort, cleanliness, safety and originality. You can book your stay on the website or by phone. Recommended for those looking for a homestay who would like the security of an advance booking. This is an interesting and cheap option for adventurous travellers. Couchsurfing is a huge hospitality network where hosts from around the world allow travellers to stay on their couches or in their spare rooms for free. There are hundreds of hosts registered in Kerala, and this is an amazing way to get to know local people and see the ‘real’ Kerala. Even if you don’t want to stay with the hosts you can arrange to meet them while you are in Kerala for a chance to meet locals and make new friends. Many people are worried about the security of couchsurfing, but over 4 million positive experiences have been registered, which is an incredible 99.794% success rate. If you are still worried you can choose to only stay with hosts that have been verified and have positive references from other couchsurfers. There are some amazing couchsurfing hosts in Kerala, including the chance to stay in an eco-friendly hut on a coffee plantation in Wayanad, or with an Ayurvedic doctor on the beach in Kannur. Recommended for adventurous travellers and those on a budget looking for a unique Keralan experience. Twitter is a social networking site where members post short (140 character) messages. There is a great travel community on Twitter who you can ask for hotel recommendations, or you can search to find out what people are saying about a particular hotel. Almost Fearless has published a useful ebook called Twitter for Travellers which features great advice on using Twitter to find travel tips. There’s even a cheat sheet on how to set up a Twitter account for those just starting out. I posted a question on Twitter asking how people found great accommodation. @Monica530 pointed me to her Travel Secrets article where she recommends not booking hotels in advance so that you can negotiate cheaper prices. Recommended for travellers who already use Twitter, or those who’d like to learn. The most traditional way to find accommodation is with a guidebook. You’ll have plenty of reliable listings in one portable package. The downside is that thousands of other travellers will be using the same guide, so these options can get crowded. For pros and cons of each of the major Kerala and India guidebooks you can read my reviews of The Rough Guide to Kerala , Lonely Planet India and Lonely Planet South India. Recommended for everyone (it’s always useful to have a guidebook on hand), especially travellers who won’t be booking in advance. Great accommodation can really make your stay in Kerala, and there is a fantastic range on offer. Here are some useful resources for finding accommodation in Kerala, whether you are looking for a budget homestay or luxurious resort. I-escape is a wonderful website that focuses on hip hideaways and boutique places to stay. If you are looking for somewhere stylish and special to stay in Kerala then this is the website for you. 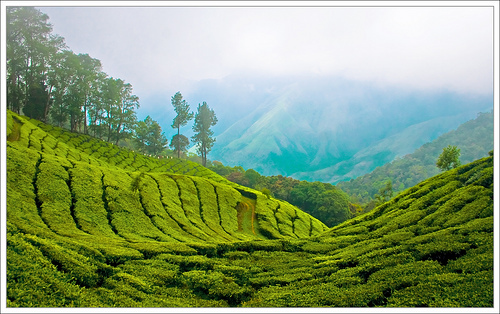 The Kerala section has lots of practical travel information (when to go, activities, places to visit, travel tips) and lists over 30 places to stay sorted by area and budget. Everywhere from homestays to palaces are covered, and there’s even an eco-friendly houseboat run by electric motor. The best feature of i-escape is the detailed reviews of every place to stay. These are the most comprehensive accommodation reviews I have seen on the web, and give you a complete picture of the hotel. They include an unbiased breakdown of the pros and cons of each hotel; photos and detailed descriptions of the rooms, food and activities; links to other reviews and of course prices. You can even book your stay through i-escape. There are some amazing places to stay in Kerala reviewed on i-escape. The only downside is that prices are high for India. Recommended for honeymooners, and travellers with a larger budget looking for a unique and stylish place to stay. TripAdvisor is the most popular accommodation review site on the web. It currently lists over 1000 accommodation options in Kerala from family-run homestays to huge resorts and international chains. The reviews are submitted by readers so are unbiased, although it can get confusing when people have vastly different views on the same place. Each listing is rated out of five, so you can sort by the top rated hotels. I prefer looking in the B&Bs/Inns and Specialty Lodging sections to find smaller and cheaper places to stay in Kerala. The Hotels section is where you’ll find the bigger and more expensive resorts and hotels. TripAdvisor also features a forum where you can ask questions. Recommended for everyone. It covers all accommodation options. India Mike is a very helpful India travel forum where you can read or post questions on all aspects of travel in India. To find accommodation in Kerala you can search the forum, post a question on the Kerala branch of the forum, or read reviews of over 300 hotels listed in the Kerala Hotels section. Recommended for everyone, especially travellers looking for budget accommodation. The Lonely Planet website features the useful Thorn Tree forum where you can search and read old posts, and ask questions on the India branch. You can also search for accommodation in the Hotels section on the website. Not all of the listings have been reviewed by Lonely Planet writers, and you need to search by city, so you can’t browse all Kerala listings. If you use one or more of these websites you’ll be able to find some great places to stay in Kerala. In Part 2 of How to Find Great Kerala Accommodation I’ll be recommending more useful resources for finding Kerala homestays and hotels, including an interesting option for free accommodation. Kerala is one of the best places in India to celebrate Christmas. About 20% of the state’s population is Christian, and people of other religions may also join in with the celebrations. Signs of the festive season are evident in Kerala for weeks leading up to Christmas Day. One of the loveliest Keralan Christmas traditions (also found in Goa) is hanging a Christmas star outside homes and shops. They come in a range of colours and patterns, and a lighted lamp is placed inside at night for a magical effect. The beautiful stars are found everywhere in Kerala, even outside the homes of non-Christian families. Most Christian families will also have a crib and a Christmas tree outside their homes. The photo above is taken of the amazing and unique Christmas tree and crib display created by the family at Community Greenpalm Homes, a homestay in the Keralan backwaters. 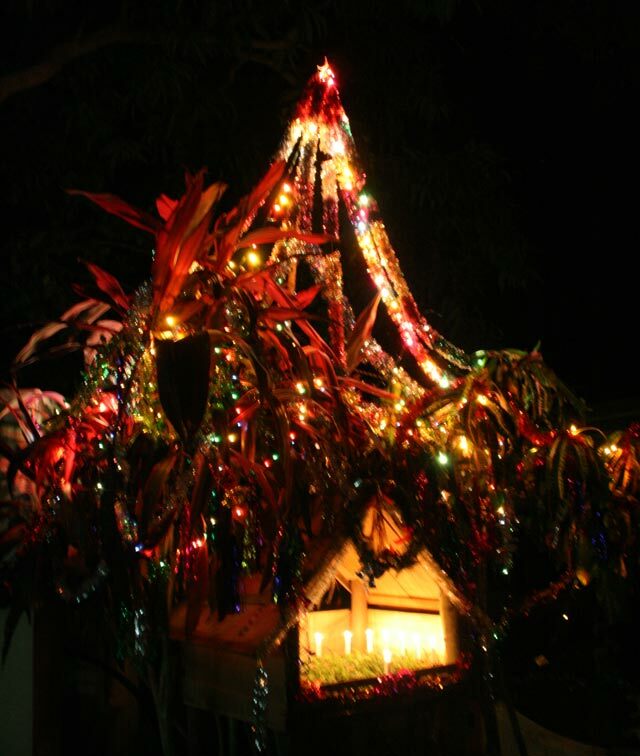 We had never seen such a magnificient and inventive Christmas display, using the local palms and plenty of colourful decorations. As everywhere in the world, Christmas in Kerala is celebrated with mass on Christmas Eve in the churches, and lots of delicious food on the day itself. I’ll be taking a blogging break next week to focus on my own festive celebrations and to work on my upcoming Guide to Kerala Houseboats ebook, which I’m hoping to release early next year. Merry Christmas everyone! This is the final part of our Kerala Guidebook Review series. I have recommended The Rough Guide to Kerala and Lonely Planet South India, but if you are touring the whole of India then the newly released Lonely Planet India is a great choice. The Lonely Planet India is a brick of a book. Its 1244 pages weigh in at 1kg/2 pounds, but are packed full of practical information covering every region in the country. The structure and layout is the same as the Lonely Planet South India, so see my review of this for more details. As in the other guide the Highlights, Getting Started and Itineraries sections provide a great overview of India and help to plan a trip to this huge country. The main differences are the lack of colour food section (although the food section is quite detailed), and language phrases are only listed in Hindi and Tamil. Each state is covered in its own chapter. The Lonely Planet South India guide has slightly more info on the Southern states, but not a great deal more. As usual the Lonely Planet guides are very strong on budget accommodation listings, transport information and maps. Helpful transport information. I believe Lonely Planet provide the best advice on how to get from A to B. Activities section is great for planning a trip around an interest such as bird-watching, kayaking or yoga. This is a huge and heavy book. I recommend doing what we did and cut out the chapters of the states you won’t be visiting. We also cut out the state we were in so that we didn’t have to carry around the whole book for daytrips. Lonely Planet is the most popular guide with travellers in India, so you could end up following the crowds, especially with the accommodation recommendations. So which guidebook is right for your trip to Kerala and India? If you are just visiting Kerala go for the Rough Guide to Kerala for the most specific cultural and practical information in a very compact book. The Lonely Planet South India is a great choice if you are travelling further afield, and if you are venturing all over the country then you won’t go wrong with the Lonely Planet India. Just do your back a favour and cut out the pages you don’t need!